Not everyone wants chocolate for Valentine’s Day. Here are three better-for-you options for that someone special. Marchesi de Frescobaldi Laudemio Harvest Extra Virgin Olive Oil (photo #1). Silky and elegant, this olive oil is so good we prefer it to butter on our bread, drizzle it over vanilla ice cream, anoint a great steak and yes, dress a salad. The oil is so good, you don’t need vinegar—just a squeeze of fresh lemon or lime. The Frescobaldi family has been making wine in Tuscany since 1000 C.E., and olive oil since 1300. In the Middle Ages, Laudemio was the term given to the best part of the harvest, the EVOO destined for the table of the lord of the manor. 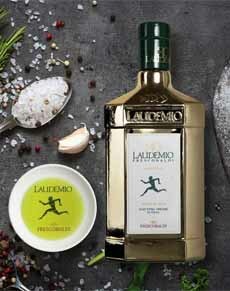 Today, the name Laudemio Frescobaldi is given to one of the finest expressions of extra virgin olive oil. This 2018 harvest marks the 30th anniversary of the Laudemio brand. For this special occasion, the olive oil has been packaged in a beautiful gold bottle, reminiscent of a perfume bottle owned by the Marchesa Fiorentina Bona Frescobaldi. The bottle is a keeper: When you’ve finished the contents, refill it with the current vintage. The 2018 vintage, just pressed in October, is fresh, delectable and waiting for anyone who appreciates fine olive oil. You can purchase it on Amazon ($43.99) and at other retailers. Here’s more about Laudemio. American Wagyu Staples ($99): This package features cuts of American Wagyu Top Sirloin and Ribeye Filet, for a delicious dinner for two (photo #2). 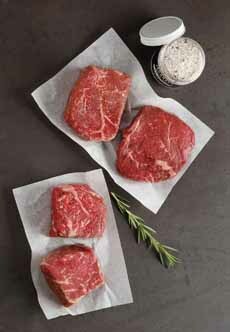 First Class Filets ($199): For a larger group, this package includes six 8-ounce American Wagyu filet mignons. There’s also a jar of Jacobsen Black Pepper Infused Salt to season them with. Thomas Keller’s Gold Bar Gift ($325): Chef Thomas Keller’s package features American Wagyu beef and K+M chocolate bars. Perfect for a night in with loved ones, this package also includes a cooking guide from Chef Keller and a recipe for the K+M Pot de Crème. There are many other meaty gifts to consider. Their Kurobuta ham is perhaps the best ham in our memory. See all of the choices at SnakeRiverFarms.com. Yonanas was created for ice cream and sorbet fans who want the experience without the refined sugar. It turns fresh fruit into soft serve “sorbet,” by processing the fresh fruit in the machine (photo #3). Yonanas almost instantly transforms your favorite fruits—bananas, berries, mango, pineapple, the whole fruit department—into a silky-smooth frozen confection. All you have to do is pre-freeze the fruit. Outstanding extra virgin olive oil in a 30th anniversary gold bottle (photo courtesy Laudemio Frescobaldi). Wagyu for an intimate dinner for two (photo courtesy Snake River Farms). 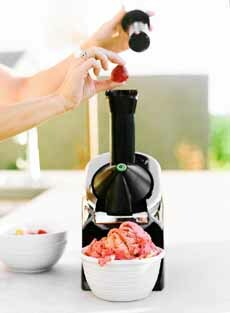 No-sugar-added sorbet, ready in a minute with the Yonanas Frozen Treat Maker (photo courtesy Yonanas). Then, take the fruit from the freezer, toss it into the chute, and it emerges as thick, creamy soft serve-like “sorbet.” In a minute, you have your frozen treat. There’s no sugar added. If your fruit ends up lacking in natural sweetness, our hacks are to sprinkle the sorbet with a bit of agave, honey or Splenda. Yonanas Classic is available at retailers nationwide starting at $39.99. Check it out at Yonanas.com.